- 3D character of supported gold catalyst particles. « Seeing » the particles in situ provides a unique tool for analyzing the size dependence of reactivity. 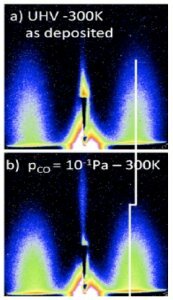 Is the catalytic oxidation of CO by Au/TiO2(110),much debated, due to a quantum effect (2D particles) or coordinated (3D) ? Simultaneous analysis of reactivity and GISAXS operando, in good agreement with experiments on dispersed catalysts shows that the reactive particles are 3D (maximum responsiveness for 2.1 ± 0.3 nm) and suggests responsiveness associated with coordination. 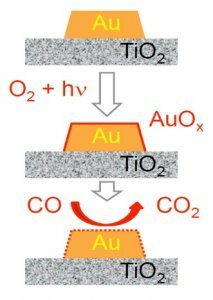 Catalytic oxidation of CO on gold supported on TiO2(110). Reactivity as a function of particle size (measured by GISAXS). The height of the particles is also given. I.Laoufi, M.-C. Saint-Lager, R. Lazzari, J. Jupille, O. Robach, S. Garaudée, G. Cabailh, P. Dolle, H. Cruguel et A. Bailly J. Phys. Chem. C 115 (2011) 4673 [link]. 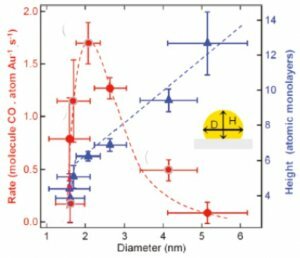 - Observation of activated oxygen on the surface of gold nanoparticles by high-pressure photoemission. Activation of oxygen by supported gold nanoparticles, which is not understood, was analyzed by « ambient » photoemission (100 Pa), in collaboration with the group of H.-P. Steinrück, Erlangen. 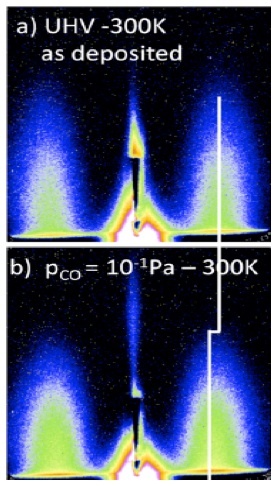 The activation of oxygen induced by X-rays with the formation of AuIII is demonstrated (it raises the question of the relevance of chemical analysis by this technique). The activated oxygen reacts with CO.
Schematic representation of the oxidation reaction of CO with gold nanoparticles. K. Dumbuya, G. Cabailh, R. Lazzari, J. Jupille, L. Ringel, M. Pistor, O. Lytken, H.-P. Steinrück et J. M. Gottfried, Catalysis Today, 181 (2012) 20 [link]. - Disruption and aggregation of supported platinum nanoparticles by CO exposure. The behavior of Pt particles supported on MgO (100) were studied by GISAXS in the presence of carbon monoxide. Exposure to CO results in disruption and aggregation of platinum. The platinum particles with a size less than 1 nm disintegrate to form carbonyl which then agglomerate to larger particles. Particles with sizes between 1 and 2 nm agglomerate after diffusion. These phenomena are related to the relative CO-Pt, Pt-Pt and Pt-substrate bond energies. It is suggested that similar mechanisms are at work during the interaction of CO with other catalysts from the high end of the transition series. Image GISAXS patterns of a 0.3 nm Pt/MgO(100) film deposited at 300 K (a) after vacuum deposition, (b) after exposure to 10-1 Pa CO. The shift of the image to the center of the reciprocal lattice corresponds to an increase in the size of the supported Pt particles by agglomeration of particles too small to be seen by GISAXS. N. Chaâbane, R. Lazzari, J. Jupille, G. Renaud et E. A. Soares, J. Phys. Chem. C 116 (2012) 23362 [link].